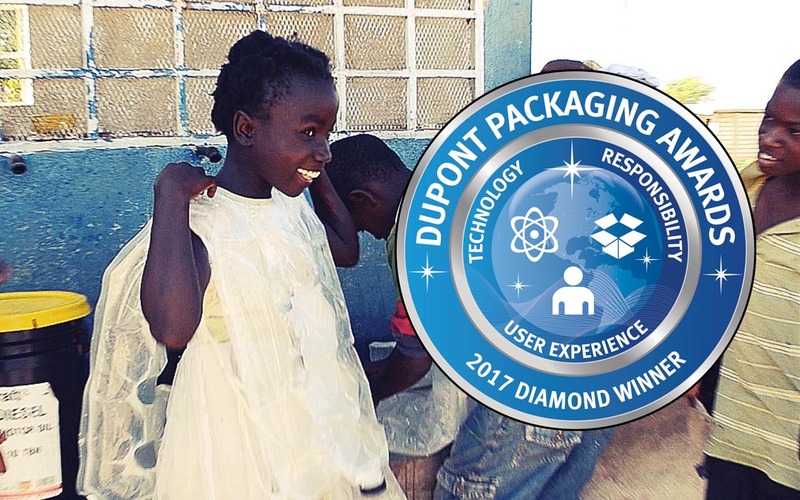 The Packaging Company is absolutely thrilled to congratulate Solutions Inc. on its Fritz™ Water Vest winning the Diamond Award in the 2017 DuPont Awards for Packaging Innovation. The judges panel awarded the Fritz™ Water Vest with the competition’s highest honour, citing its out-of-the-box solution for helping people in developing countries carry water to their homes safely and easily. They felt the vest’s construction, ergonomic design and its practical intentions best exemplified how important and beneficial packaging technology can be. The Fritz™ Water Vest held its own against some expectedly strong competition from several well-known packaging developers. Just a few of the other innovative packaging solutions in the running included the Compostable “Pizza Pod” from Zume Pizza, the Cryovac® OptiDure™ Abuse Bag by Sealed Air, the Insignia Freshtag from Insignia Technologies and the Cross-Directional Laser Scored Flow Wrapper by PepsiCo and Printpack. This is proof of just how unique, socially-aware and (most importantly) useful the Fritz™ Water Vest truly is. The Fritz™ Water Vest is comprised of a multi-layer nylon structure, making it suitable for repeated use on rough terrain and in dry, rugged environments. An additive included in its liner material inhibits the development of mold, mildew and odours. Together, these properties make the vest a robust, hygienic and reusable water-carrying and storage pouch. We’re proud to be partnered with Solutions Inc. and their efforts to improve the lives of those in developing countries around the world. That’s why every time someone shops with The Packaging Company, we contribute to the creation and delivery of Fritz™ Water Vests. You can learn much more about the Fritz™ Water Vest, and how to help those who need the vests most, right here. Diamond Award Winner at the 2017 DuPont Awards for Packaging Innovation. Congratulations to everyone at Solutions Inc. from your friends at The Packaging Company!